After reading the reviews, I thought I’d give this coffeehouse a try. The slogan: “One Big Living Room” is so descriptive of the feel! You just want to settle in with your cup and relax. The atmosphere is cozy, uniquely decorated with lots of eclectic art, chairs, tables, books, and a record player! Yes, you can play your vinyl albums at Zed’s. The staff is very attentive and accommodating. They have a wide variety of food offerings and desserts. I ordered “The Drink of the Day”~ a White Chocolate Coconut Cappuccino. Say that three times fast! It was absolutely delish! The foam was insane! It must have stood at least 2 inches tall! So tall, I started consumption with a spoon! Perfectly blended and carefully crafted this cappuccino was one of the best. 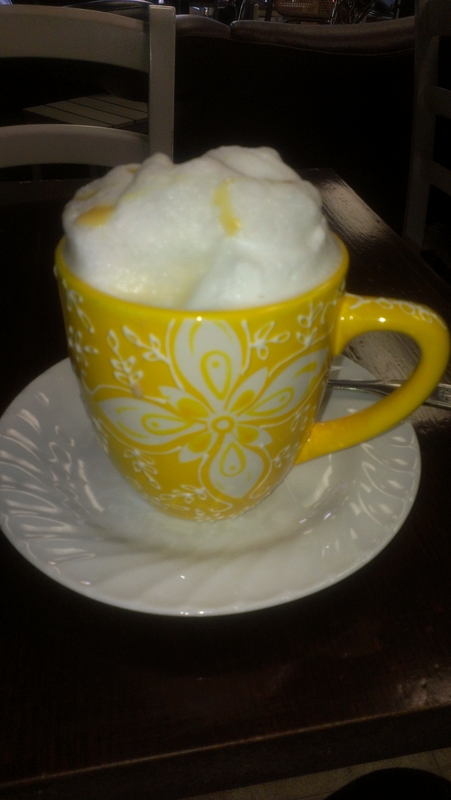 Categories: Uncategorized | Tags: cappuccino, coffeehouse, esspresso, latte, Silver Spring MD, Zed's Cafe | Permalink.